Prostate problems can be an uncomfortable topic for men as they are related to both sexual issues and with problems urinating. However, if left untreated, prostate issues may turn into conditions that can only be resolved through surgery, injections, or other more intrusive treatments. There are many supplements on the market targeted at prostate health. 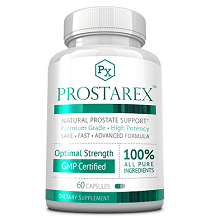 These products use blends of ingredients designed to soothe the urinary tract, improve urine flow, and improve overall prostate health by reducing the size of the prostate gland to a healthy level. More than 50% men 60 years of age or older experience symptoms of an enlarged prostate. 90% of men over the age of 80 realize the same condition. This is because the prostate glands never stop growing in males. Typically, this leads to issues once in an advanced stage. 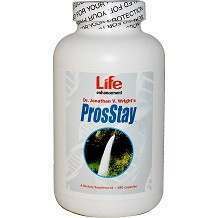 The good news is that products like Life Enhancement ProsStay that can eliminate the symptoms of an England prostate and improve prostate health. You just need to find one that utilizes the right components that is best for you. The manufacturer recommends taking 1-2 capsules with meals or as otherwise recommended by your physician. The manufacturer cautions that this product is not for use by children or by pregnant or lactating women. If you’re taking blood-thinning medications, such as warfarin, do not take any form of Vitamin K without consulting with a physician skilled and knowledgeable in nutritional medicine as well as the doctor prescribing the warfarin before making any changes. Internet pricing may vary from website to website. At the time of writing this review this product was found at a price of $34.98 for a bottle of 180 capsules, which under the suggested use should last about one month. The manufacturer offers a 30-day money-back guarantee. This product is lacking in having a guarantee. It also does not appear to have the FDA inspection so many product manufacturers seek to assure consumers of high quality manufacture and effectiveness.